I had a fun post planned for you today, but unfortunately I got hit with a nasty bug this past weekend and never made it that far. The first three posts of the week were written in advance (thankfully! ), but while I had grand plans to work on this Thursday post over the course of the week I actually spent most of the week in my pajamas either napping on the couch or sleeping in my bed. I'm pretty sure it has been years since I have been this sick! Tea, cinnamon sugar toast (like mom used to make when I was sick! ), and flannel pajamas. And Clery has been snuggling up with me all week. Part of me thinks he's going to be sad to see me go back to work after so much time together, but the other part of me knows he will be psyched to have his dog walker come back and take him on real walks since I didn't have the energy for that this week. I have big plans to be back in action next week with better health and new posts. In the meantime, enjoy your weekend! I love discovering new restaurants-- and I love it even more when they're located in my neighborhood, just a leisurely stroll from my place. And SIP Southport & Irving is exactly the kind of place I want to walk to on warm spring night: a creative menu, cozy atmosphere, and quiet neighborhood location on the north tip of the Southport Corridor. The vibe here is very speakeasy-esque with heavy curtains, tufted leather benches, live jazz on weekends, and a prohibition era-inspired cocktails. And the food menu is equally as inspired-- with globally influenced dishes as a nod to American cuisine being a melting pot of different ethnic food traditions. Alex and I walked up Southport to SIP one unseasonably warm spring evening and immediately decided to take advantage of their outdoor patio. It is situated on the corner of Southport & Irving Park (hence the name), a quieter part of the bustling Southport Corridor. It was the perfect place to sip wine and catch up with Alex after a long Friday at the office. SIP has an extensive craft cocktail menu, a great wine list (I was loving this summery rose), and Alex ordered off of their beer list which had tons of great seasonal and craft options. We started off the meal with a little amuse-bouche: SIP's housemade pimiento cheese spread served with a few flatbreads and the most delicious house pickled radishes. The spread was fresh, creamy, and flavorful and paired with the tangy radishes it was the perfect little first bite. The menu at SIP is arranged from the smallest plates to the largest, so no matter if you want to share everything or nothing or something in between they've got you covered. Alex and I started by sharing the poached lobster and coffee-cured bacon dish. 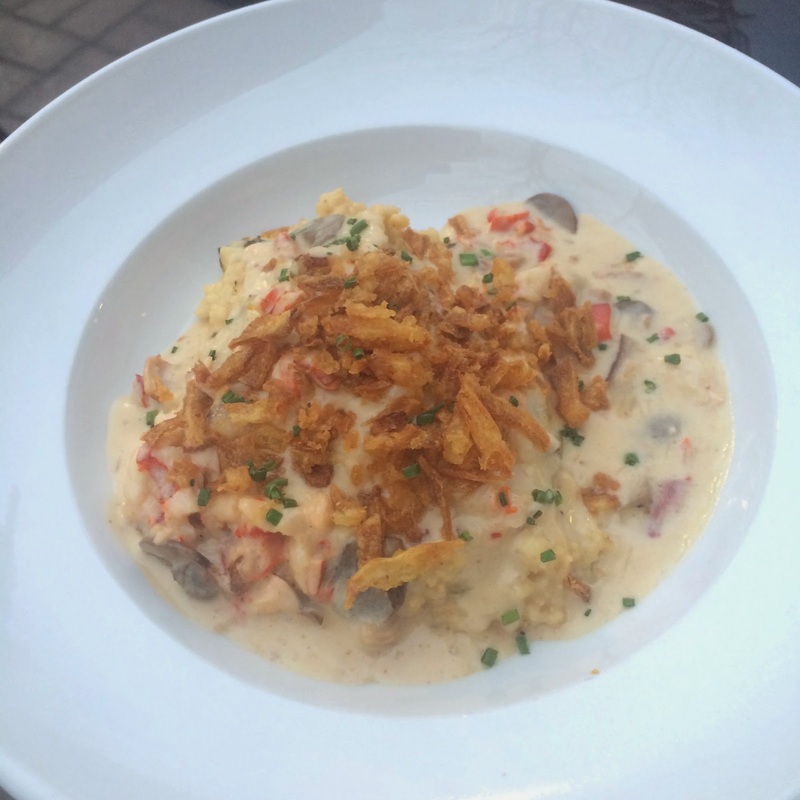 The lobster and bacon was plated over spicy and creamy poblano cheddar grits with wild mushroom cream. The sweet lobster with the subtle heat of the poblano worked really nicely together. The grits were extra creamy and a sprinkle of fried onions on top was a perfect textural foil. Alex doesn't even really like polenta, but he dug right into this dish. And I would absolutely order this again-- even as an entree. One of my favorite dishes of the night was the Smoking Goose and Great American Cheese Collection market board. As soon as it was placed in front of us we were wowed by the variety and how beautiful it looked. Plated on a huge slate board with tons of vibrant colors, this was like no charcuterie board I've ever seen. The board includes a few meats from boutique Indianapolis butcher in Smoking Goose (our favorite was the Stagberry Salame, made with elk, blueberries, and meade), a variety of cheeses, raisins, pickled beets and cauliflower, turmeric hard boiled eggs, housemade kalamata tapanade, and a few slices of Texas toast. This was not your average meat and cheese plate and the flavors here were just as intense as the gorgeous colors on the board. It was a real showstopper! Alex and I decided to share entrees as well so that we sample a few more things together. 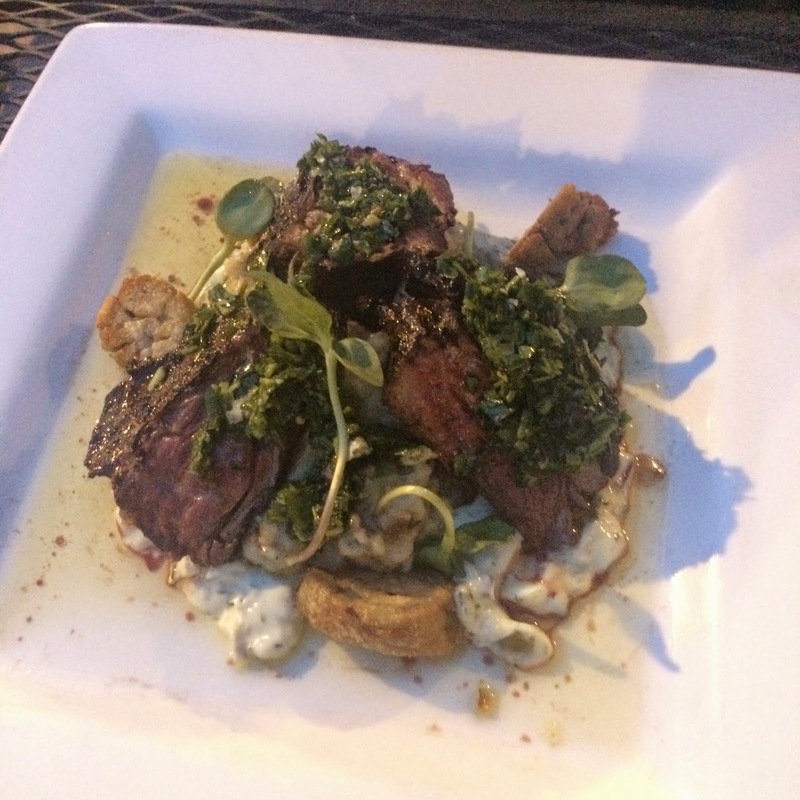 We first tried the hanger steak-- one of the heartier dishes on the menu. The steak was nicely seared and served with a super flavorful chimichurri sauce, fried sweetbreads, and sauce gribiche (a thick and flavorful egg-based sauce) all served over the most delicious and creamy sunchoke and potato mash. This dish was rich and decadent with tons of flavor, but the portion was perfectly sized so that it wasn't an overwhelming amount of food. Thinking that we needed some veggies to go along with all of this, we also ordered a side of the grilled broccolini. 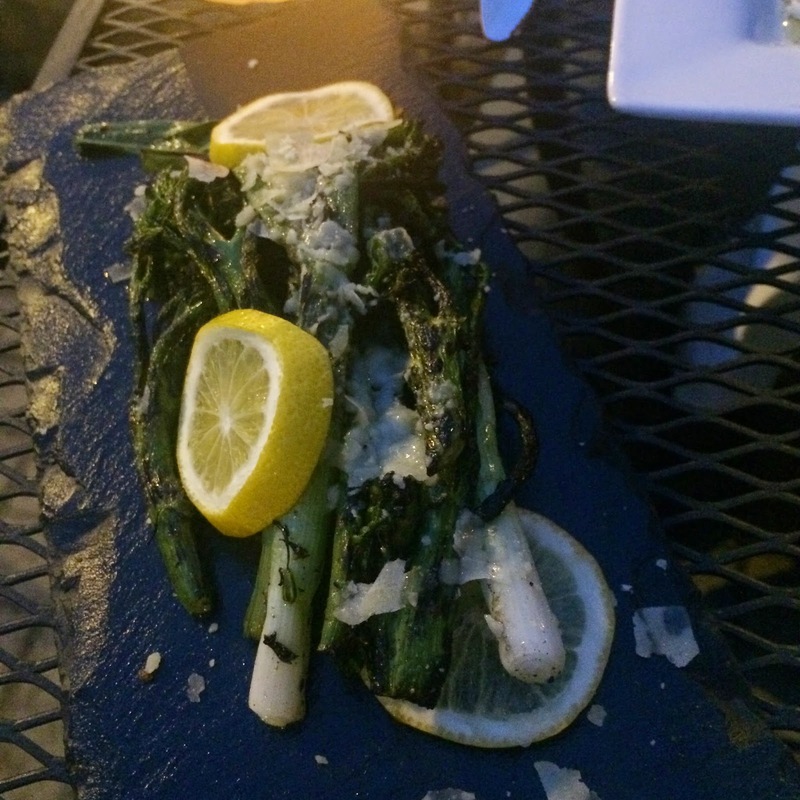 The broccolini had a delicious charred flavor with a little sweetness from the addition of Meyer lemon and some salty Parmesan cheese. It was a simple and tasty side and I loved the grilled scallions they added to the mix. As you can see, we enjoyed quite a spread that night so we didn't have any room for dessert. 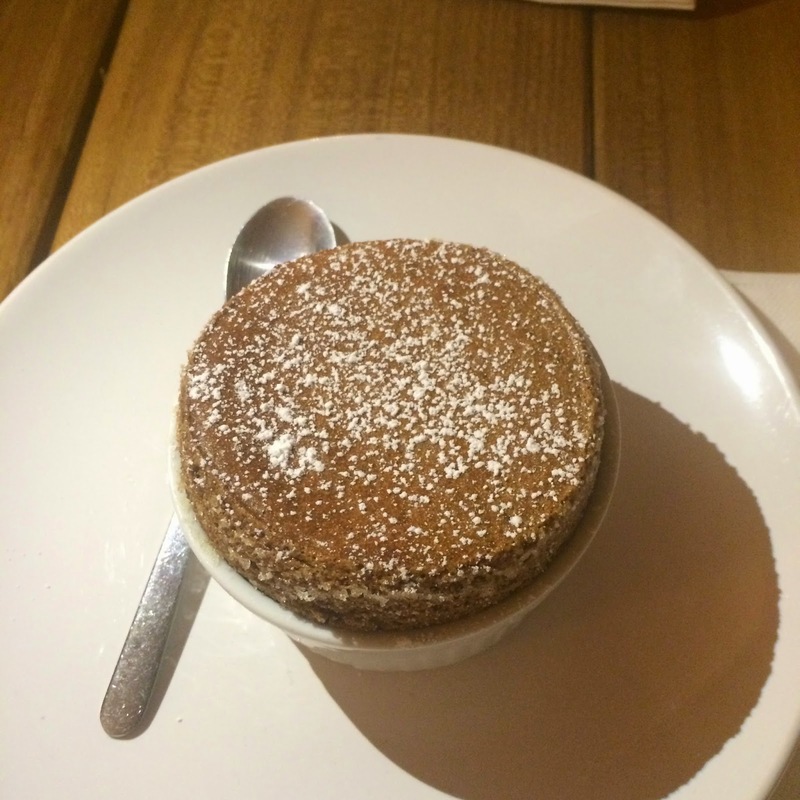 The next time we come back I am definitely saving room for the Elderflower creme brulee! SIP is such a great little hidden gem and I'm so glad we had the chance to dine here. I see many more date nights, summer patio cocktails, and a few brunches (their brunch menu looks amazing!) in our future as Lakeview residents. 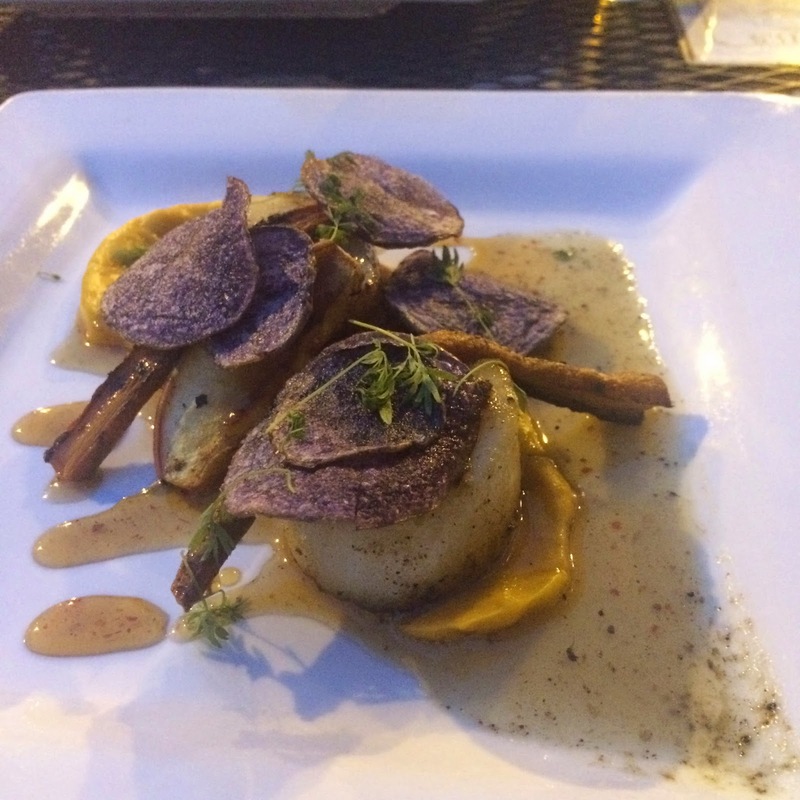 Editor's Note: While our meal at SIP Southport & Irving was complimentary, the opinions expressed here are-- as always-- my own. I didn't want you to have to wait another 4 months for the next installment of the Lakeview Neighborhood Guide, so decided today was the perfect day to bring you the next part of that series. And today, it's all about sandwiches! Sandwiches seem pretty basic, right? Well, coming from a neighborhood where quick and delicious sandwiches were few and far between-- the options were either major sandwich chains or the French Market, which was closed on Sundays-- I feel spoiled living in a neighborhood now where we can walk a few blocks to a handful of really good local sandwich spots. There are few notable places just on the edge of West Lakeview in neighboring Roscoe Village, so I'm including those today too. 90 Miles Cuban Cafe is a tiny place on the far western edge of Roscoe Village. They have a second location in Logan Square and I had always heard tons of buzz about this place but had never been until recently. The Roscoe Village location is down the block from our vet and every time we walked by the smell of this place made us hungry. So one day we planned accordingly and stopped in to pick up lunch on our way home from one of Clery's appointments-- such a good decision! This place is super tiny and only seats a dozen people, at best (plus a few outdoor tables in the warmer months) so it's ideal for takeout or if you're a small group looking for a quick and hearty meal. Their authentic Cuban menu is extensive and everything we ordered was super flavorful. I went the traditional route and ordered a Cubano sandwich. The sandwich was packed with ham, thick slices of roasted pork, pickles, and mustard. 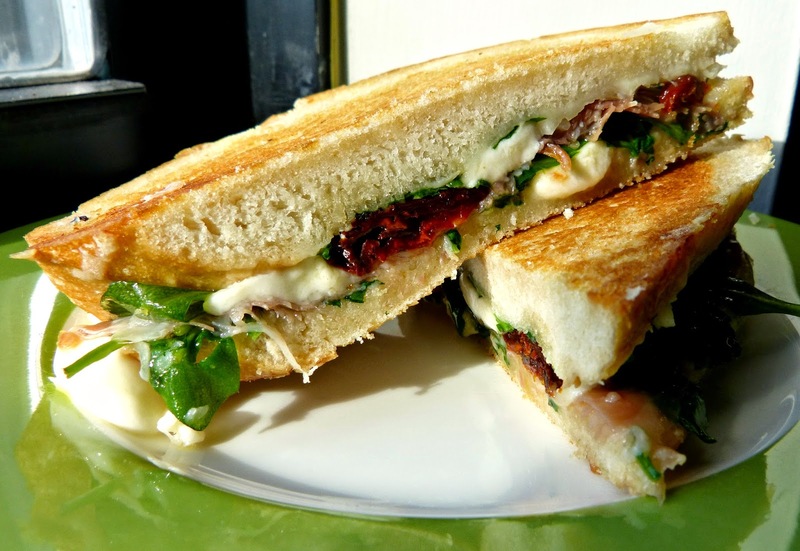 A generous amount of melty swiss cheese held it all together between two slices of crusty toasted bread. Alex went with the Bistec de Palomilla: It also started with toasty crusty bread piled high with thinly sliced steak, grilled onions crispy shoestring potatoes, lettuce, and tomato dressed in a flavorful chimichurri sauce. 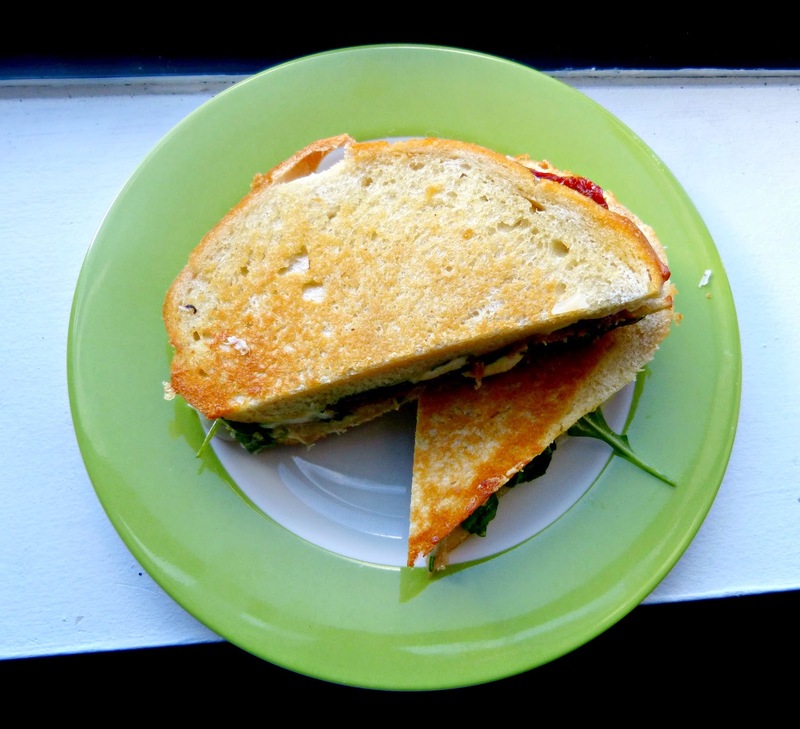 The sandwiches were huge and filling and would have been perfect for dinner too! We also ordered a few of their sides to go along with our sandwiches. First, some traditional tostones: fried plantains served with chimichurri for dipping. The tostones were a little tough and chewy, but the flavors were delicious. Alex and I both agreed that the yuca frita was our favorite though. The fried yuca was crispy on the outside and pillowy soft on the inside-- almost like thick cut steak fries-- and they were served with the most delicious garlic mojo oil for dipping. We also grabbed a few of 90 Miles' signature hot sauce for dipping and for adding to the sandwiches, which I would highly recommend! Costello's is located right in the heart of the Roscoe Village neighborhood on a bustling stretch of W. Roscoe Street. 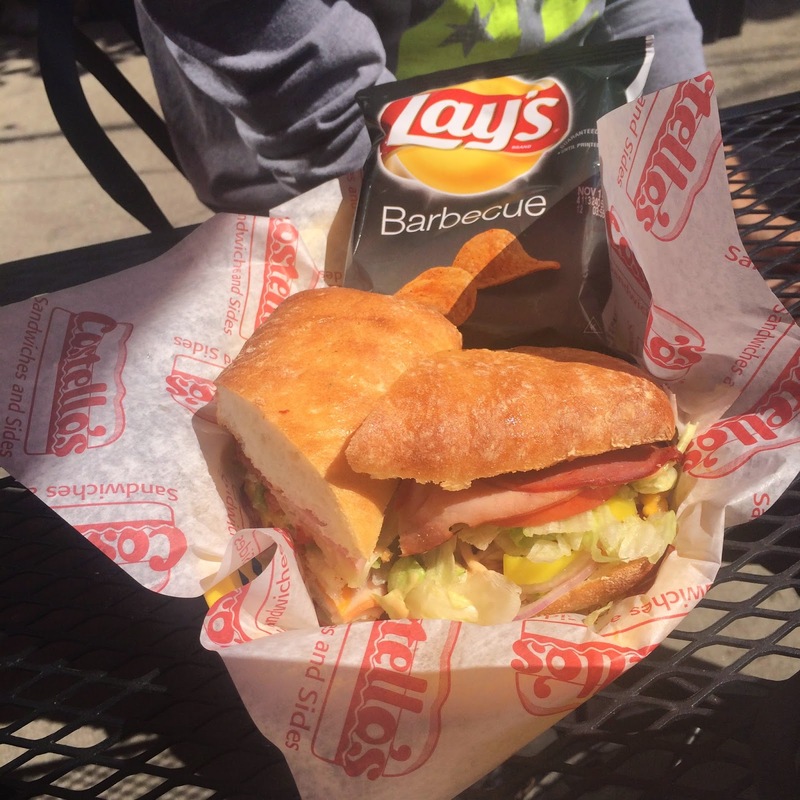 And it's the perfect place for a really good deli-style sandwich. Alex and I love to walk here in the warm weather and eat on their back patio. Or sometimes we order online, walk the dog up to pick it up, and bring it home when we're having a lazy weekend. 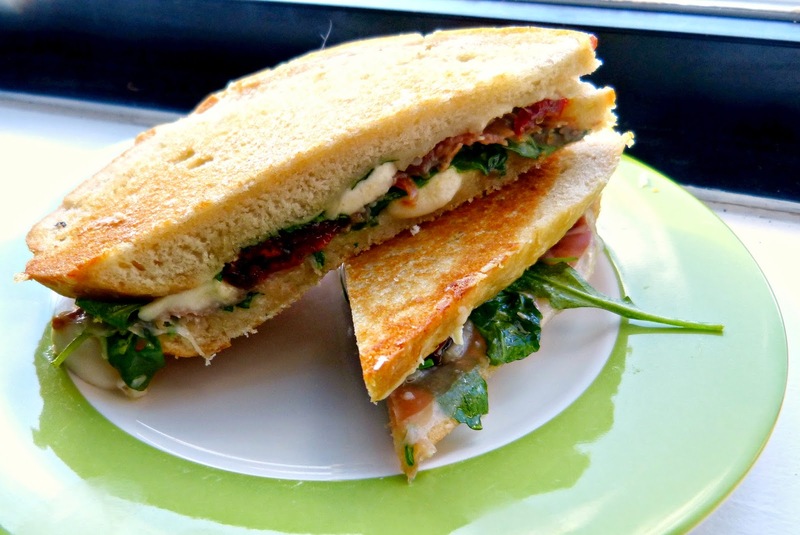 Costello's is known for their grinders and their toasty 'baked is better' sandwiches. They're not gourmet and there are no obscure ingredients here-- but everything they use is fresh and high quality. We have eaten here a handful of times and have sampled a few sandwiches on the menu. Alex and I both have our favorites though and those are our 'go to's' when we want a weekend sandwich. I like the Roast Turkey Grinder: Thinly sliced turkey, provolone, tomatoes, lettuce, onion, pickled pepper rings, garlic mayo, and their classic vinaigrette on a crusty sub roll. Alex likes the spicy Subpocalypse baked sandwich: Generous servings of smoked turkey, capicola, and ham with jalapeno bacon, cheddar and pepper jack cheeses, lettuce, tomato, onion, and smoky chipotle ranch, toasted until warm and the cheese is melty. Big & Little's has created a lot of buzz on the Chicago food scene for a while now. 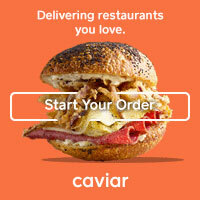 They began as a small shop in a far off corner of River North, gained a cult following, were featured on Diners, Drive Ins, & Dives, moved to a bigger River North location, and then opened a second location up north in the Lakeview neighborhood just a few blocks from the Belmont Brown & Red Line stop. Quite a ride for a funky little fast casual restaurant! The menu here is the real draw and the reason for their success: an eclectic selection of tacos, burgers, and sandwiches that blend traditional fast food with ethnic, regional, and high end ingredients like foie gras, pork belly, a variety of seafood, to name a few. The River North restaurant is near Alex's office, so he's been there several times and knew exactly what he wanted to order when we visited our neighborhood location: A traditional cheeseburger with a side of truffle fries. He devoured the burger and I managed to steal a few of the fries, which were really tasty: I love handcut fries and these were crispy, not super greasy and a hint of delicious truffle flavor... no ketchup necessary! This was my first visit to Big & Little's and I was totally overwhelmed by their menu-- so many good options! Ultimately, I decided on the shrimp po' boy: a toasted roll filled with tender fried shrimp, lettuce, tomato, a drizzle of lime juice, some spicy cocktail sauce, and B&L's Special Sauce, a sweet and spicy chili aioli. This was a good sandwich! It was generously filled, the shrimp was perfectly fried (not doughy or super greasy), with a flavorful combination of sauces. I spotted kimchi fries on the specials menu and knew I wanted those for my side! Those same handcut fries were topped with B&L's 'sticky sweet Asian sauce,' more of that chili aioli Special Sauce, caramelized Korean style pickled cabbage & bok choy, and a sprinkle of sesame seeds. 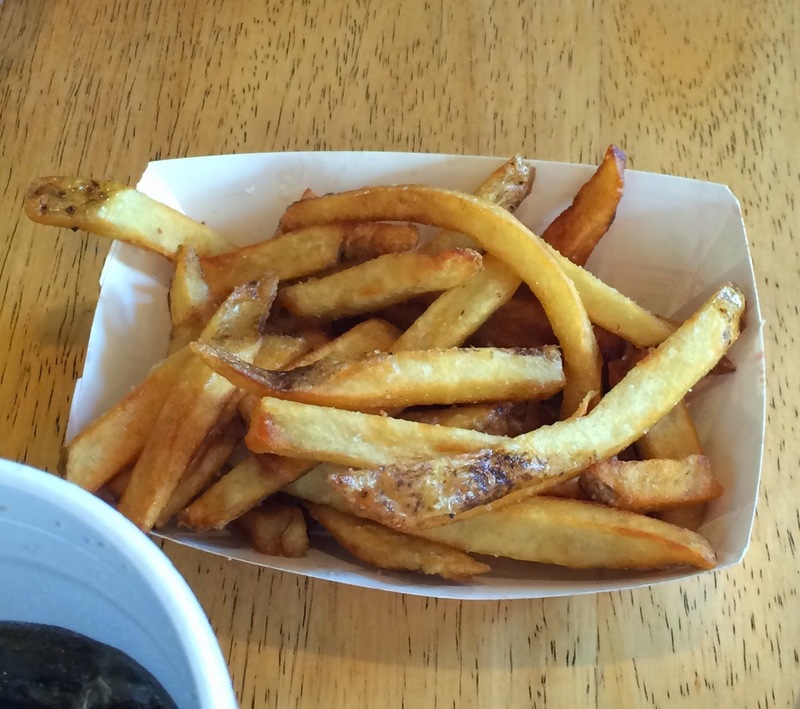 These fries were loaded and the combination of flavors: salty, sweet, spicy, sour-- was so delicious! These are knife and fork fries, for sure. Although it is a bit frigid this week, the sun is out and spring has arrived in Chicago. And with the arrival of spring, I'm ending my winter hibernation-- and suddenly there are so many fun things to take part in! I try not to pack my calendar with too many events, but a few things have come my way lately that I just couldn't pass up. Here's a glimpse into my life, lately.. 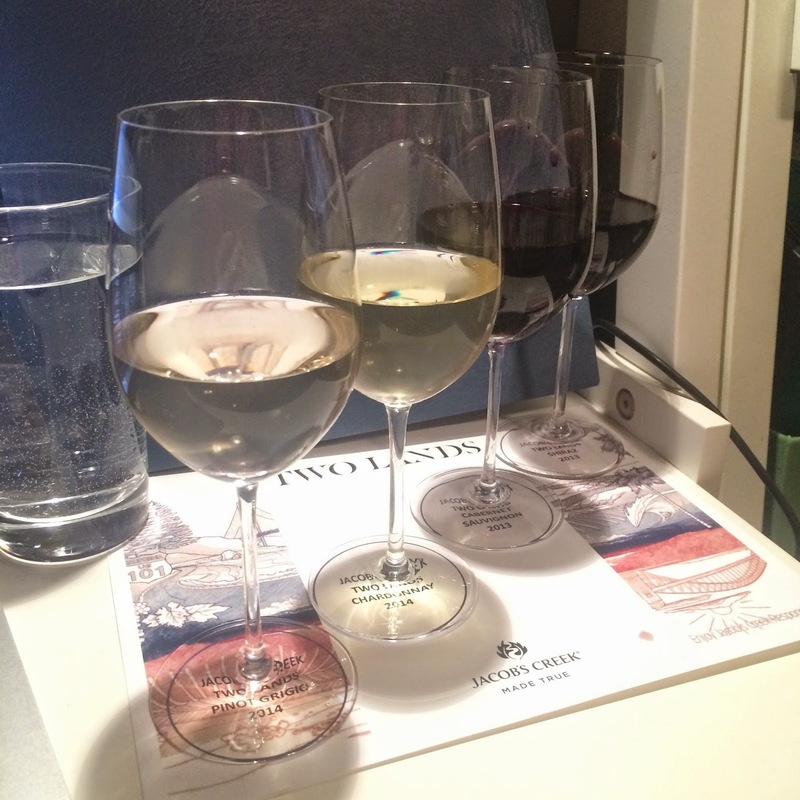 I've attended many a wine tasting, but never one like the one recently hosted by Two Lands: It was a virtual wine tasting! I joined several other food and wine bloggers from around the country for a wine tasting hosted virtually by the founders of Two Lands from their Australia headquarters. I tasted my wines from the comfort of my home office, in my yoga pants, with my furry pal Clery by my side. So much fun! Two Lands was founded by winemakers Ehren Jordan and Bernard Hickin with one simple goal in mind: to marry the fruits of Australian vineyards with the craftsmanship of California winemaking to create one new high quality line of wines that represent both regions. Get it? Two Lands? They guided us through the tasting of their four new varieties and the thoughts among the tasters were pretty unanimous: we loved the crisp flavor of the Pinot Grigio, which is the perfect wine for sipping on a hot summer evening! And everyone raved about the smooth bold flavor of the Shiraz. And great news for you: These wines are a great deal, retailing around $13/bottle and available at major retailers (like Binny's!). For Christmas, I treated my friend Alexis (and myself) to a French cooking class. We finally cashed it in recently and showed up for an intensive course in French cooking. The class at Cook Au Vin was small and intimate and our chef was legitimately French (and even indulged us in a few bars of Le Poisson from The Little Mermaid) and guided us through creating a Bordeaux-inspired menu. 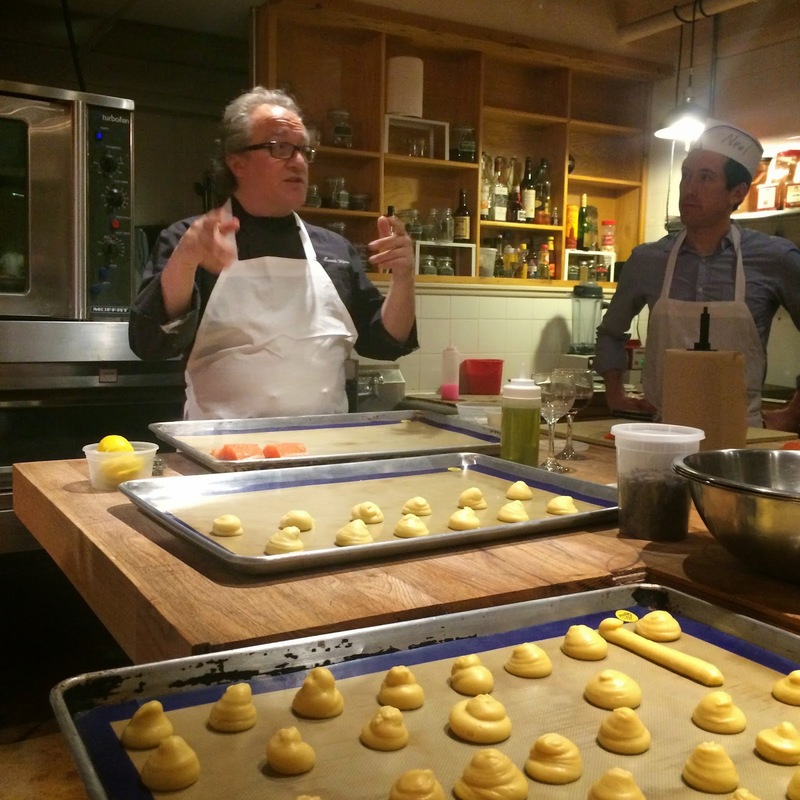 We learned how to make cheese gougeres, roasted salmon with beurre blanc, homemade fettucine, and chocolate souffle from scratch. And it was all delicious! French cooking is simple and complicated-- all at the same time. 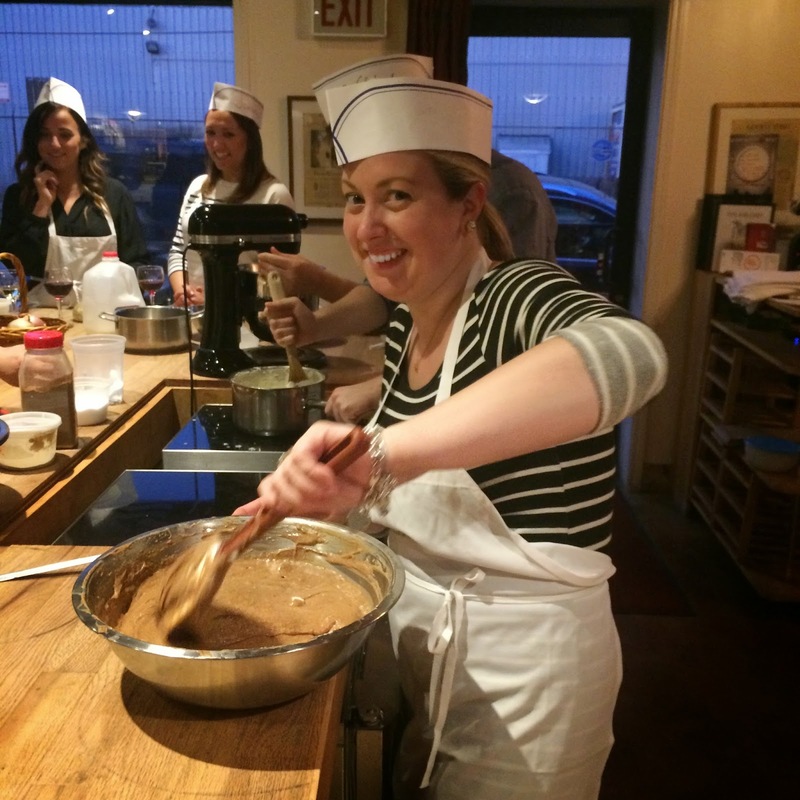 Alexis and I were tasked with making the souffle batter-- talk about pressure! Happy to say that these rich little desserts turned out perfectly. Alexis and I did a lot of eating that week! 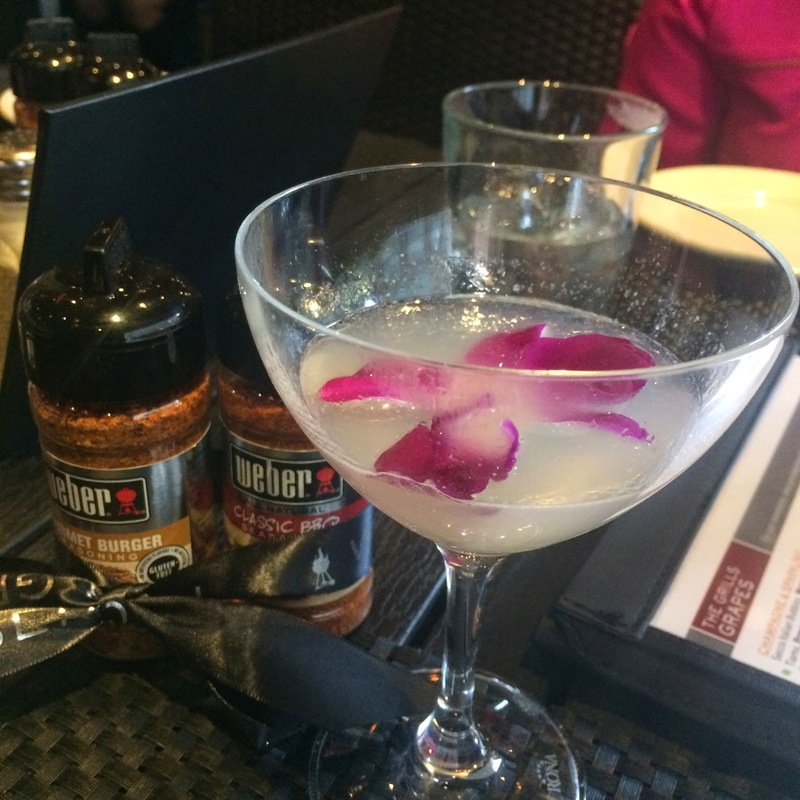 We also stopped by Weber Grill in River North to catch up with Kit and Lauren and sample their new spring menu offerings. I hadn't been to Weber Grill in forever, but the smell of a hot grill piques my interest every time I walk by. The new cocktail menu features an Old School Daiquiri, which was surprisingly tart and only slightly sweet (in a good way) compared to the daiquiris I have had before. And it was simple: just rum, sugar, fresh lime, and garnished with a gorgeous fresh flower. 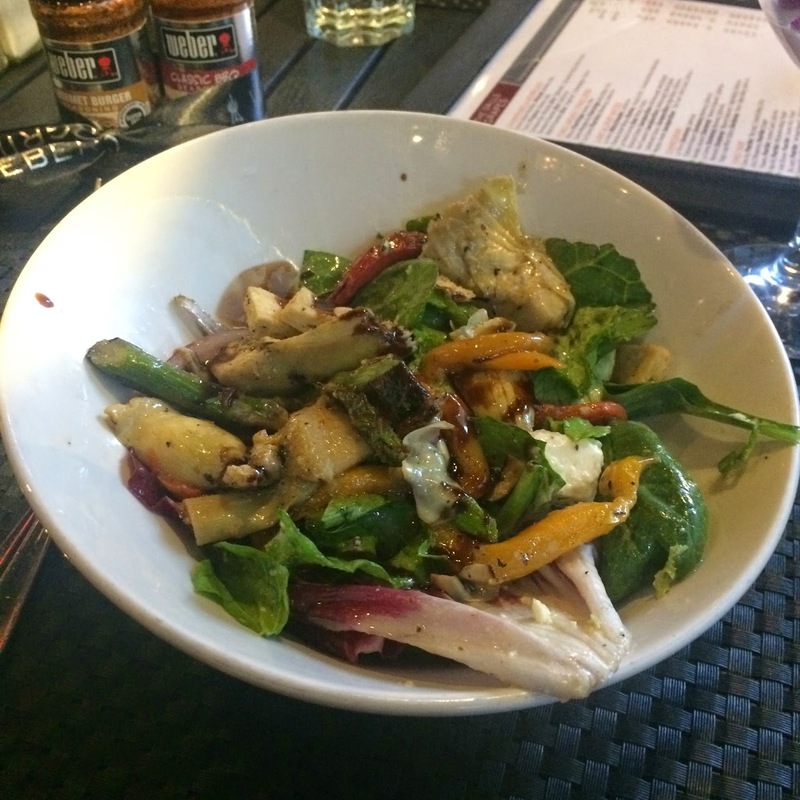 I have also been all about roasted veggies lately, so I was loving the Petite Mediterranean Grilled Vegetable Salad. There was a great variety of roasted vegetables in the salad combined with mixed greens, olives, feta, and toasty pita croutons. There were a few entree options, but I decided that since I was at Weber Grill I needed to go big and ordered the BBQ Beef Brisket. 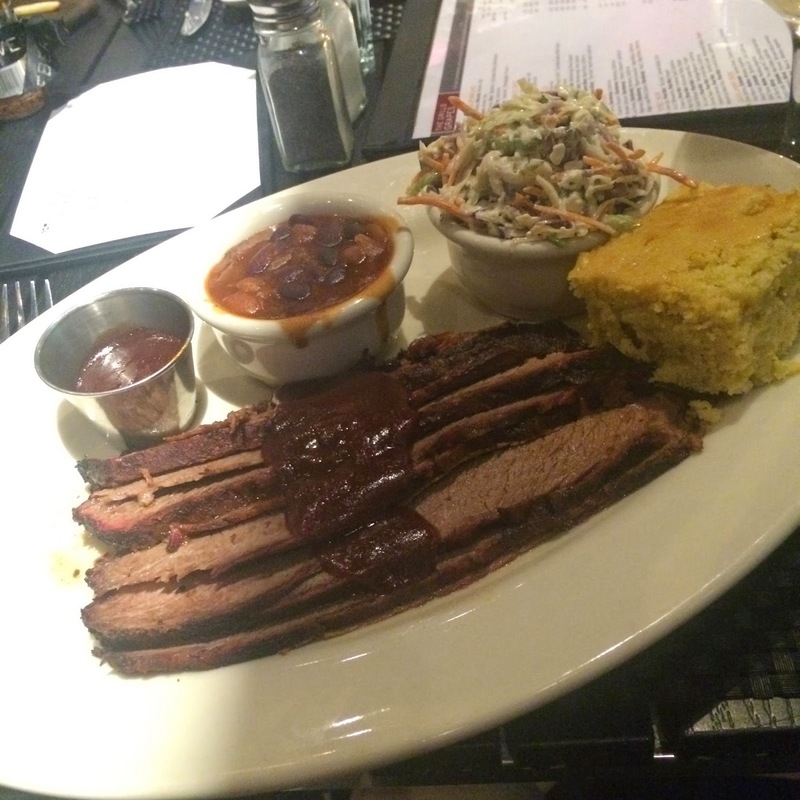 It was slow smoked for 14 hours and served with their signature BBQ sauce for the perfect combo of smoky, sweet, and spicy. And it was served with a few small tastes of BBQ staples like moist cheesy cornbread, blue cheese pecan coleslaw, and bourbon baked beans. And last but not least, I finally jumped on the Rocksbox bandwagon-- and I'm loving it! I may not be a style blogger, but I love some accessories so when Rocksbox reached out and asked me to try their services, I graciously accepted. So, what is Rocksbox? 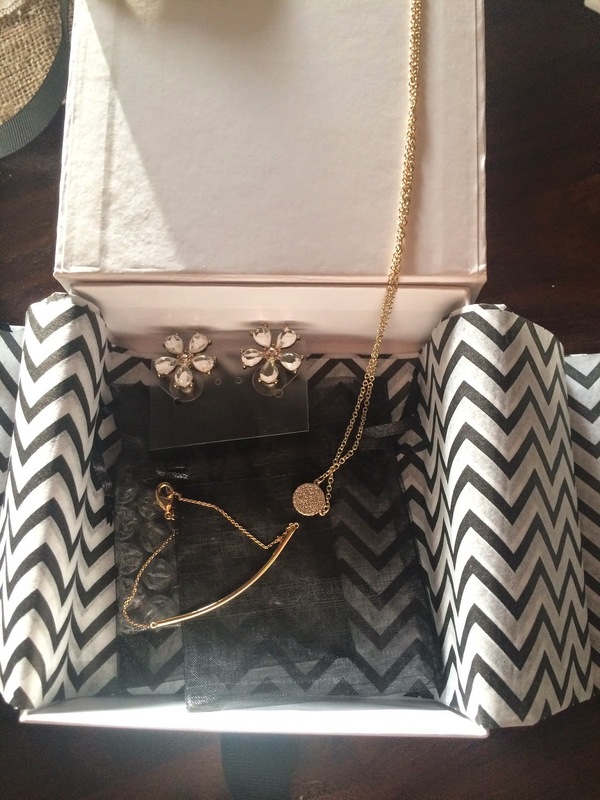 Rocksbox selects three pieces of jewelery for you try out based on your style and preferences. They send them your way for you to wear out in real life, and then when you're done you can either keep the pieces or send them back for another Rocksbox. 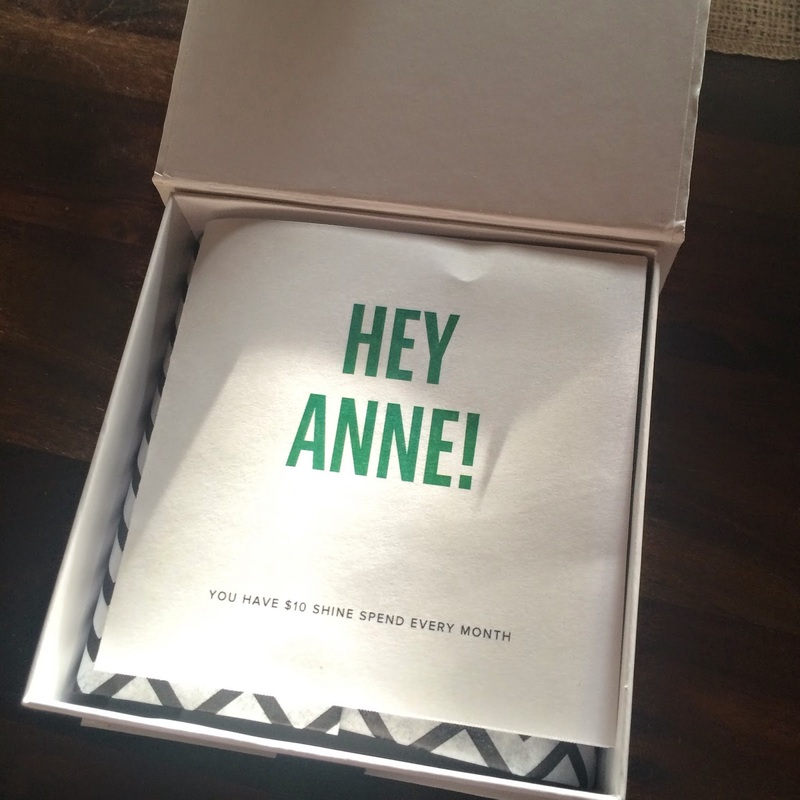 I loved my first Rocksbox and I feel like they nailed my style right off the bat. I'm obsessed with these statement earrings and am pretty sold on keeping them around. I have worn them to work, to a conference, and for a night or two out as well. Want to try Rocksbox for yourself? Use code aasquaredxoxo to get your first month of Rocksbox free! Today's recipe is of my favorite variety: taking an old 'go to' recipe and making it new, healthier, and still delicious. My mom and I discovered this recipe while watching Barefoot Contessa one summer morning while I was home from college: al dente orzo tossed with roasted vegetables, toasted pine nuts, and salty feta in a tangy vinaigrette. It was one of the best pasta salads I had ever eaten and we made it again and again that summer. It's still one of my favorite recipes to this day and I make it frequently when we host cookouts at home. 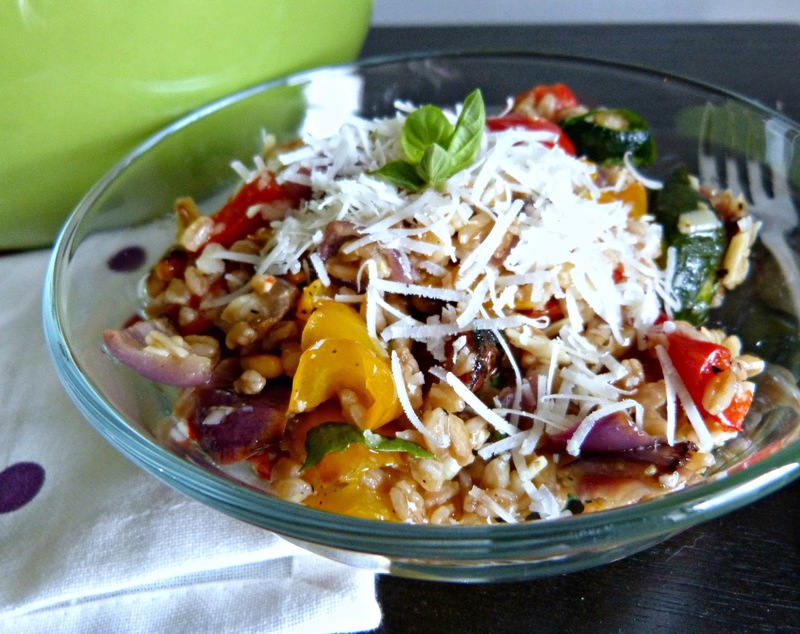 Recently, I was craving this orzo salad again. I wanted to make a big batch one weekend for a light dinner and then pack the rest up for lunch that week. It refrigerates well and is great eaten cold or at room temperature so it's a perfect warm weather dinner or lunch salad. For my version, I changed things up a bit. 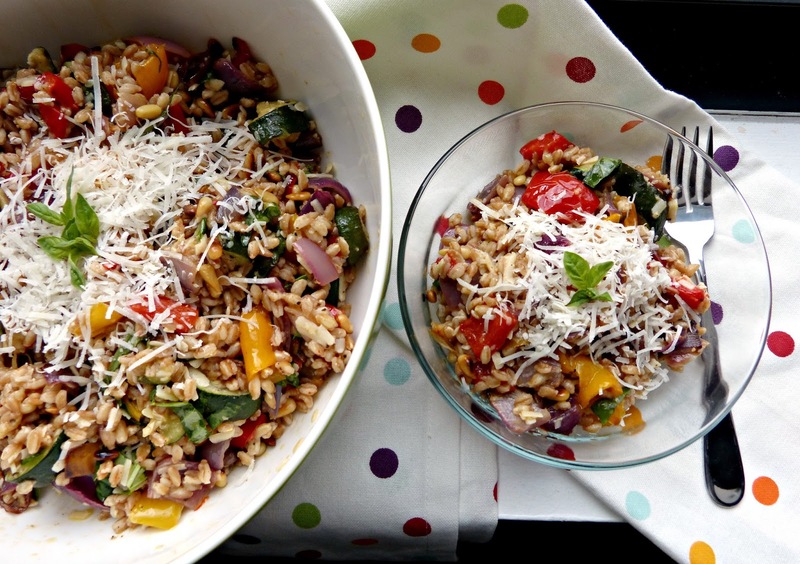 Instead of orzo, I used farro-- my new 'go to' grain. I love it's chewy texture, nutty flavor, and the fact that it offers some great health benefits like tons of fiber, minerals, and complex carbs too. This recipe works great with quinoa too, like in this version I whipped up for weekday lunches a while back. The vegetables take on such a great sweet flavor when roasted and paired with chewy nutty farro, toasted pine nuts, and the bright flavors of lemon and basil, this is the perfect light and satisfying meal. On a large baking sheet, toss red pepper, yellow pepper, red onion, zucchini, garlic, 3 Tbs. olive oil, Kosher salt, and pepper until evenly incorporated. Spread out on pan and roast for 20 minutes. After 20 minutes, stir the vegetables and then roast for an additional 15-20 minutes until vegetables are caramelized. Remove from oven and allow to cool slightly. Transfer to a large bowl along with any remaining liquid from the baking sheet. In a small bowl, whisk together remaining olive oil, lemon juice, zest, and salt and pepper. 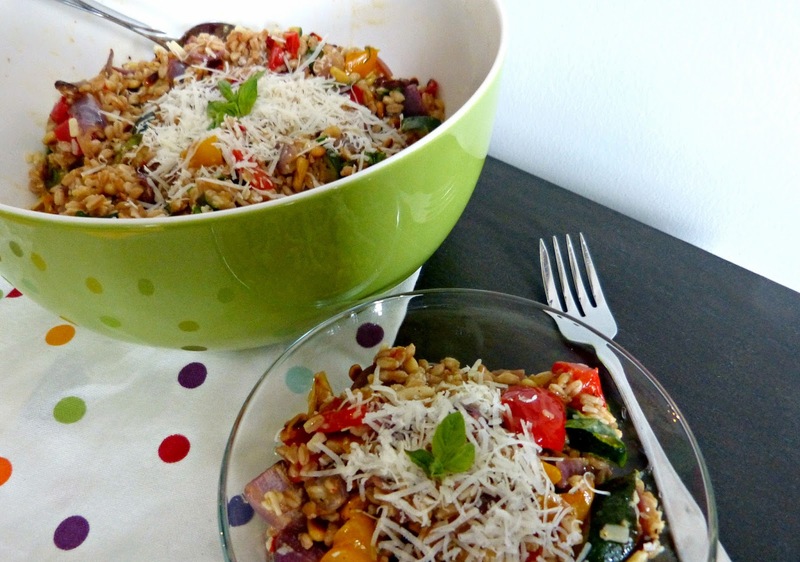 Pour the vinaigrette over vegetable mixture and add farro, pine nuts, and basil. Toss to combine and top with grated Parmesan. As you may have gathered, I travel pretty frequently. Sometimes it's for personal trips, other times for business, but one thing remains true no matter why you're traveling: It is really hard to eat well when you're on the road. And I'm not talking about just being in other cities-- because in those scenarios, it's hard to narrow down the food options-- but more about during the travel process. You know: In airports, on car rides, in random locations by yourself... it can be a challenge! I'm not at all a fast food girl (except for that one time that we went to In-N-Out Burger at 1 AM in LA), so that really limits my options when traveling. I'm assuming most of you reading this are food lovers too, so you may feel the same! So again, I have done the hard work for you and have scoped out a few notable options for you to keep in mind the next time you're on the road! I discovered Cat Cora with my mom and sister when we had a few hours to kill on our way home from San Francisco. Celebrity chef Cat Cora has opened a few airport outposts of this restaurant in Houston, Salt Lake City, in addition to the aforementioned location at SFO. The menu is in keeping with Cat Cora's cooking values: upscale versions of classic comfort food, Greek and Mediterranean-inspired flavors, and an emphasis on locally sourced or organic ingredients. With a few hours to waste at the airport, sitting here and sipping on cocktails (because we were all wined out after a few days in Napa) and having a good meal was the perfect way to prepare for a long night on the red eye. 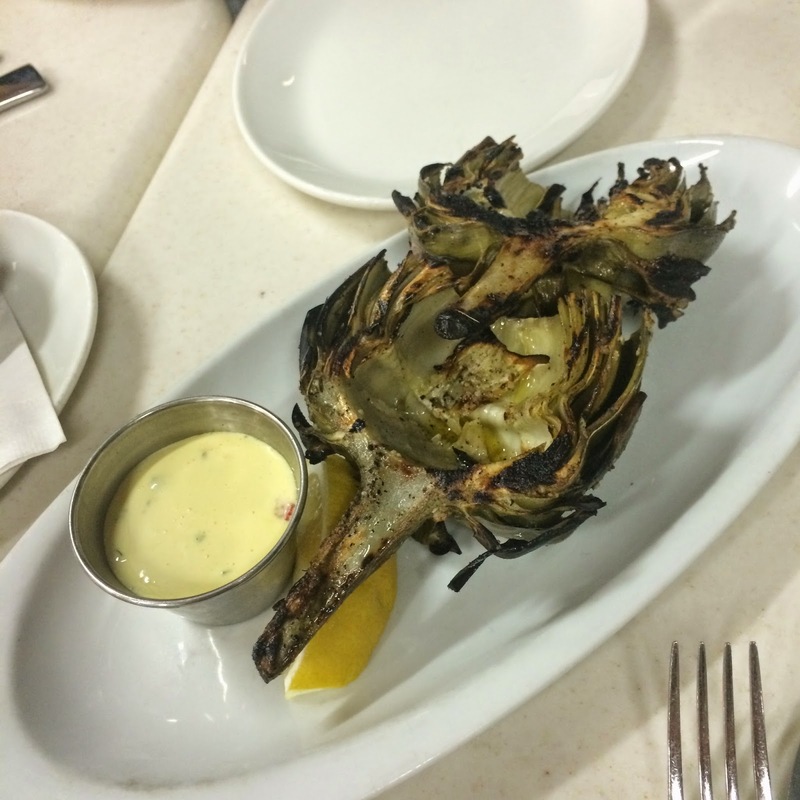 We shared a few things like the grilled artichokes served with a tangy aioli. The flavors were fresh and tasty, though we found it a bit challenging to eat. 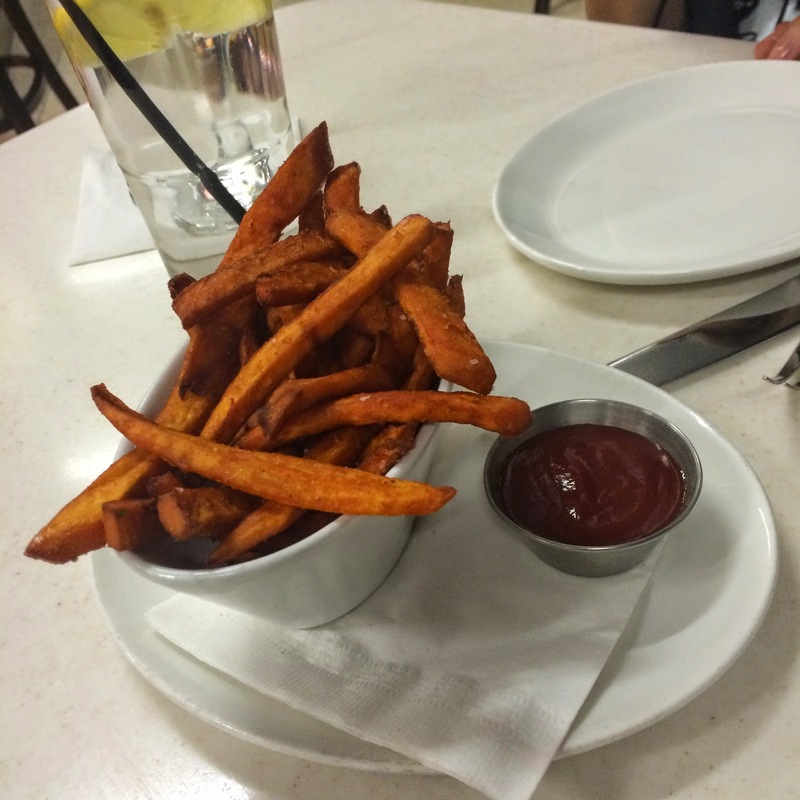 And we also shared some of the perfectly crisp sweet potato fries-- a great snack to share (or enjoy on your own) no matter how much time you have to wait at the airport. The menu at Cat Cora is mostly small plates, so it's great for sharing or for trying a few different things. I ordered the lobster mac and cheese (which got a lot of buzz online) and it was delicious-- rich and creamy cheese sauce, generous pieces of lobster, and a crunchy topping. The serving was pretty petite, which was nice since it was a pretty rich dish. To go along with the mac and cheese, I also opted for something on the healthier side and ordered the beet salad. 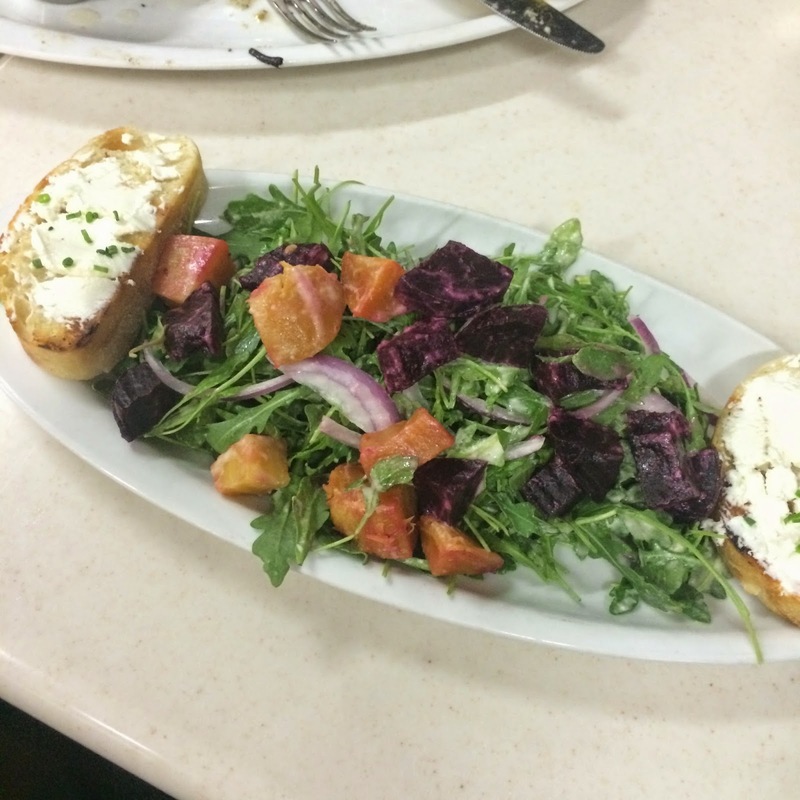 It was another small plate, but with the perfect amount of roasted golden and red beets, red onion, arugula, and a few goat cheese toasts to round it out. I felt satisfied and not sick, which is rare for an airport meal-- and ideal for boarding an overnight flight back home! 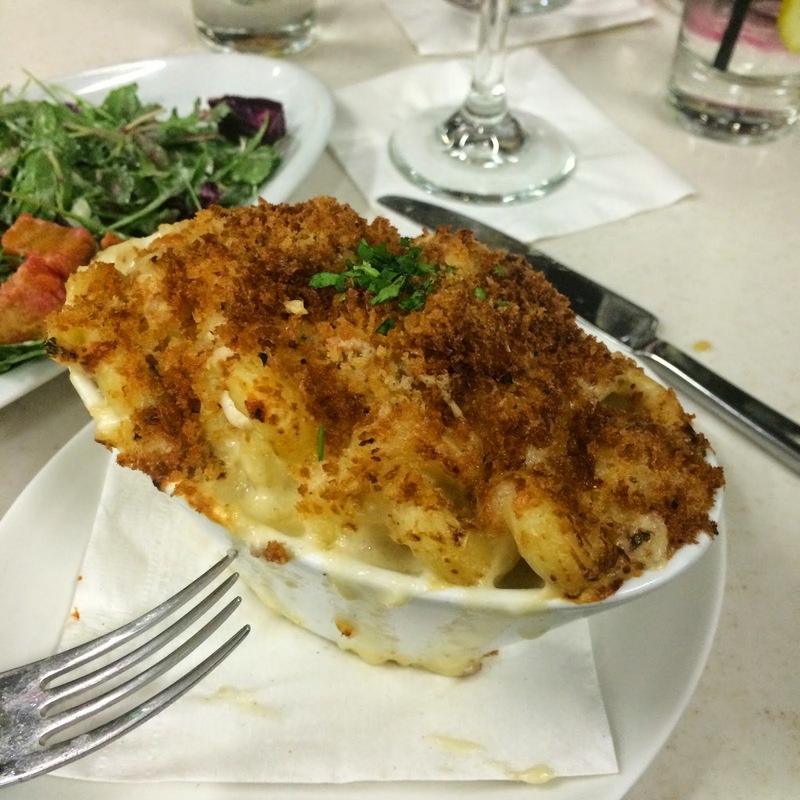 To sum it up: the food at Cat Cora isn't just good for airport food-- it's really good, in general. Blaze Pizza is a chain that's been popping up all over the US (including one location about a mile away from my home in Chicago), but I was never so happy to find one as I was on a recent business trip to Indianapolis. As I mentioned before, I'm not a huge fast food fan. I'm also not a big fan of dining out alone (I've tried and it tough), so this leaves limited options for business travel dining. Add to that the fact that by the time I got checked into my hotel it was dusk, it was raining, and I had two Powerpoints to complete... mapping a Blaze Pizza and finding it was a 6-minute drive from my hotel was the best part of that entire evening! 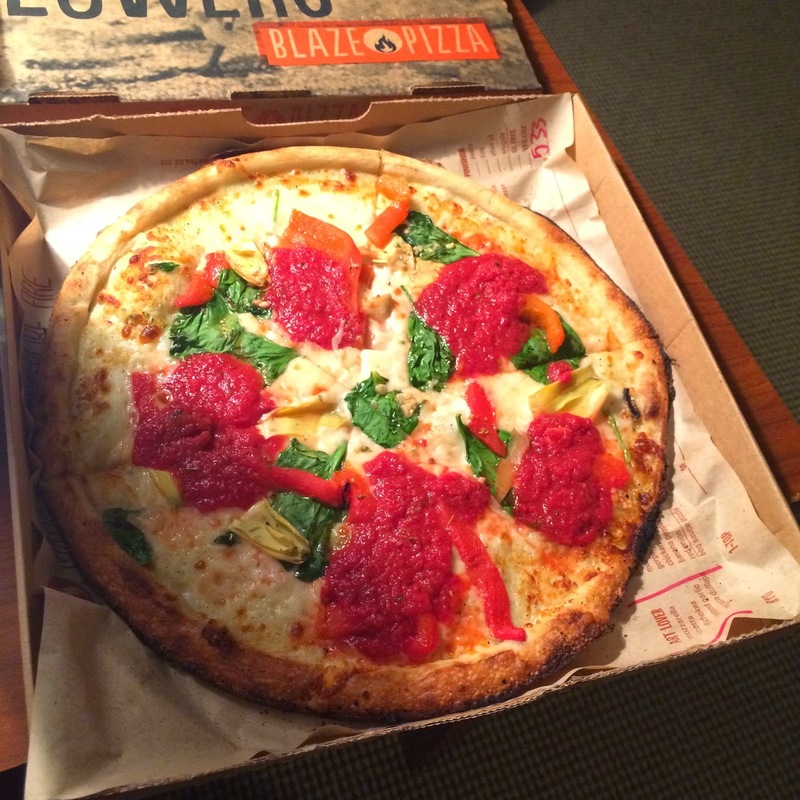 If you're not familiar with Blaze Pizza, you will be soon. They have dozens of locations around the country with several more set to open in the coming months. Three have popped up in Chicago over the past year or so. Their appeal is simple: a huge selection of quality ingredients that you can select to customize your own pizza, which is created and then fired on demand. And it's ready to eat in 180 seconds, so it's a great option for good quality tasty food (and pizza, at that!) in a hurry. Think Chipotle for pizza. 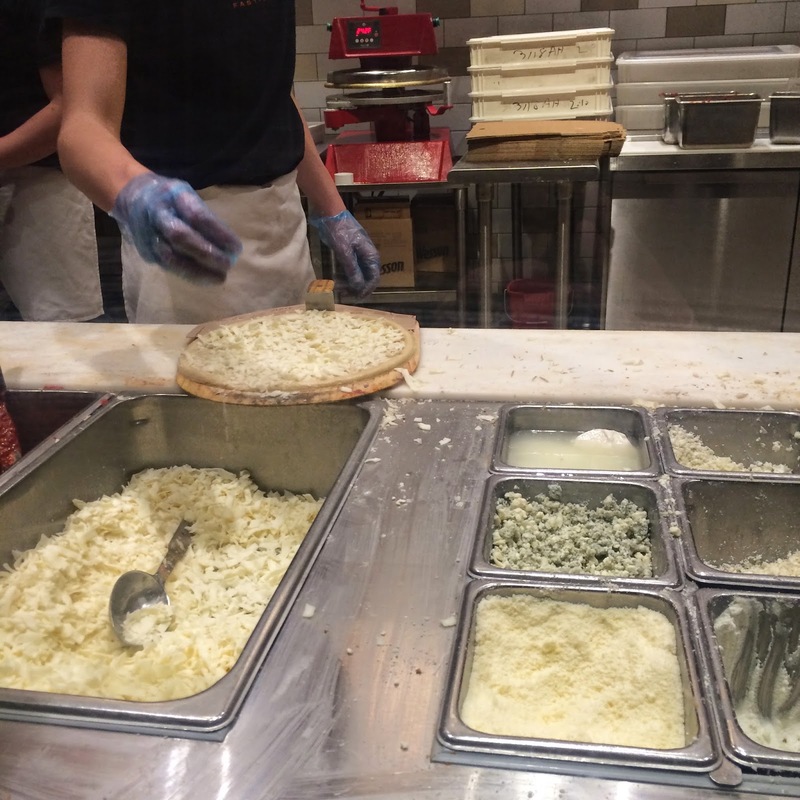 I was really impressed with the variety of fresh ingredients available at Blaze Pizza. As a foodie looking for something relatively healthy, this was a nice surprise. I opted for a pie on Blaze's Signature Pizza menu: the Art Lover. This pizza is topped with artichokes, mozzarella, ricotta, chopped garlic, and red sauce dollops. I opted to further customize it (with the help of Blaze Carmel's adorable and friendly staff) with the addition of fresh spinach and some roasted red peppers too. Each Blaze Pizza has a great crispy crust, is packaged up in ecofriendly packaging, and is the perfect size for one person with maybe a slice or two left over. And I got to have a fresh custom pizza to eat in my yoga pants in my hotel room-- exactly what I wanted that night! And then there's my old travel standby: Tortas Frontera. I have said it before and I will say it again: This is the only airport food that I actually look forward to eating. That's a big statement to make, but it is true. I will actually plan my meals on travel days around eating at Tortas. It's also one of the main reasons I would want to arrive at O'Hare with time to spare. The food is good and the lines are long... Guess the secret is out! Tortas Frontera has a few locations in terminals throughout ORD as well as a (new to me) location in the Chicago Loop too. I don't even know what to recommend here because I have tried several menu items and the food is always consistently delicious-- made fresh with locally produced and grown (some of them grown onsite) ingredients. For lunch and dinner, Tortas is obviously known for its tortas-- Tasty toasted Mexican sandwiches. I'm also a huge fan of their tacqueria salad and the guacamole bar can't be missed-- top your guacamole with anything from bacon to peppers to crumbled cheese... Or all of it! And breakfast is equally yummy there. There are a few delicious breakfast tortas available with toppings like scrambled eggs, melty cheese, crispy bacon, spicy peppers. And on the lighter side, a Greek yogurt bar with toppings like fresh granola, fruit compote, and honey. If you're traveling through ORD, I can't recommend this option enough. Nothing else holds a candle to it-- and again, it's delicious. 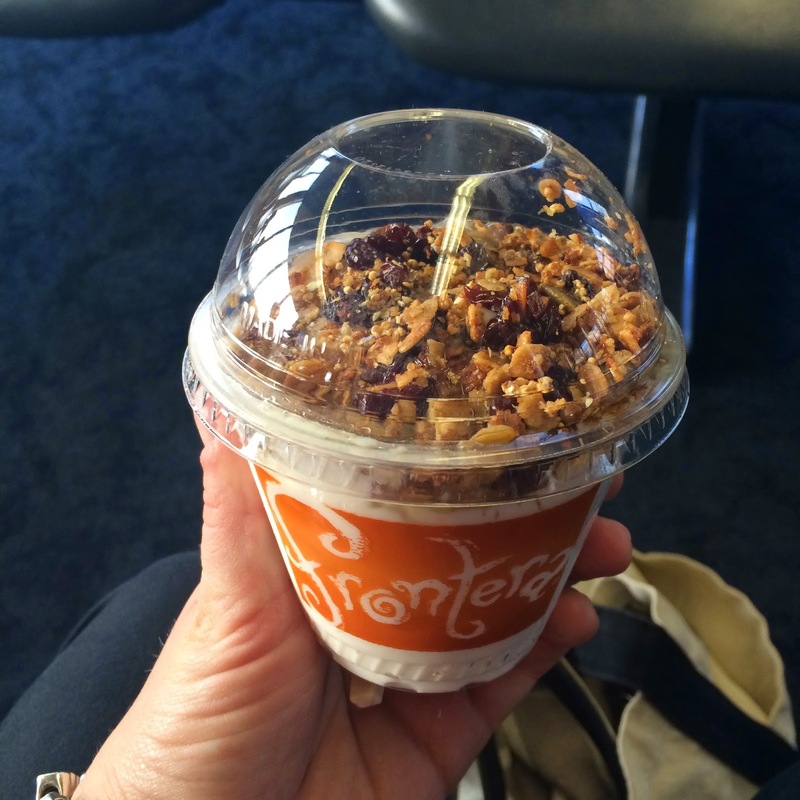 Not just delicious for airport dining.